As an orthopaedic surgeon, Dr. Landau uses both surgical and non-surgical means to treat musculoskeletal trauma, sports injuries, degenerative diseases, infections, tumors, and congenital conditions. Some conditions respond well to non-surgical treatments such as exercise, therapy, medication, casts or splints, and orthotics. Surgical orthopedic options may include knee and shoulder arthroscopy, ACL repair, knee replacement, hip replacement, repair of bone fractures, disc repair, spinal fusion, and carpal tunnel release. As peope age, osteoarthritis can cause the cartilage covering the joint surfaces to wear out, resulting in pain and stiffness. 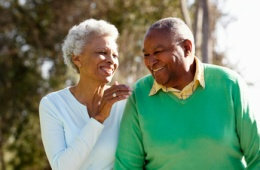 Total joint replacement will be considered if other treatment options will not relieve the pain and disability. In joint replacement surgery, Dr. Landau will remove the arthritic or damaged joint and replace it with an artificial joint, called a prosthesis. This relieves pain and improves mobility. Dr. Landau is now performing Outpatient Total Joint Replacements to qualified patients. In an arthroscopic examination, Dr. Landau makes a small incision in the patient's skin and then inserts instruments that magnify and illuminate the structures inside the joint. This lets Dr. Landau see the cartilage and ligaments to determine the amount or type of injury and then repair or correct the problem, if necessary. Candidates for arthroscopy include patients with chronic inflammation, tendon tears, impingement syndrome, persistent pain, catching, giving way, loss of confidence in the joint, and recurrent dislocations. This page contains information about the most common procedures for which Dr. Landau sees orthopaedic patients. For more general information about Murphy Wainer Orthopedic Specialists, including appointments, insurance and directions, please visit the Murphy Wainer Web Site at www.murphywainer.com. Dr. Landau has expertise on the proper surgical or non-surgical treatment for each trauma patient, with the goal of returning the patient to their pre-injury functional level. As an orthopedic surgeon, Dr. Landau is experienced in caring for any and all broken bones, including the treatment of patients with multiple fractures, compound fractures, and fractures near the joint. On his media room page, Dr. Landau has posted arthroscopic images and radiography images showing various joint conditions and the associated surgical repairs. 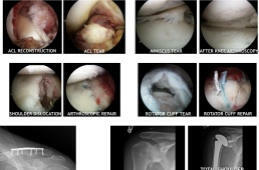 Included are images for ACL tear/repair, shoulder cuff tear/repair, broken clavicle/ORIF, arthritis of the hip, shoulder and knee along with images of the total joint replacements to repair those damaged joints. As an orthopaedic surgeon, Dr. Landau uses both surgical and non- surgical means to treat musculoskeletal trauma, sports injuries, degenerative diseases, infections, tumors, and congenital conditions. Some conditions respond well to non-surgical treatments such as exercise, therapy, medication, casts or splints, and orthotics. Surgical orthopedic options may include knee and shoulder arthroscopy, ACL repair, knee replacement, hip replacement, repair of bone fractures, disc repair, spinal fusion, and carpal tunnel release. This page contains information about the most common procedures for which Dr. Landau sees orthopaedic patients. For more general information about Murphy Wainer Orthopedic Specialists, including appointments, insurance and directions, please visit the Murphy Wainer Web Site at www.murphywainer.com (site opens in a new tab).